Syllabus of the Online Course (Subject): Digital Single Market of the European Union. Learning materials in or Mercado Digital Marché unique numérique de l’UE Mercado único digital. 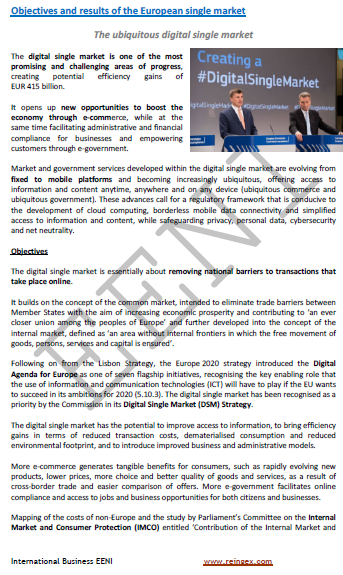 In 2015 the European Commission published the EU Strategy for the European Digital Market creation, based on two pillars: a safe and free market. In addition to relaunching the European economy. The European digital single market will expand the EU and member countries digital economy (€ 415 billion when implemented): Germany, Austria, Belgium, Bulgaria, Croatia, Cyprus, Denmark, France, Estonia, Finland, Greece, Hungary, Ireland, Italy, Latvia, Lithuania, Luxembourg, Malta, the Netherlands, Poland, Portugal, the United Kingdom (BREXIT), Slovakia, Slovenia, Spain, the Czech Republic, Romania and Sweden. European Economic Area (Europe, Western Civilisation).